Unless you’re a CPA or a tax lawyer in Paradise Valley, you’re probably just as confused about taxes as the rest of us. The tax code is huge, and you can’t know it all. Most of us just focus on learning the rules that apply to ourselves, but our circumstances can change quickly from year to year, leaving us scrambling to get questions answered about new tax obligations or exceptions. Consulting with a tax law attorney is the best way to understand how the tax laws apply to your circumstances. However, you might want to educate yourself before you meet with an attorney so that you can have a more productive conversation. Educating yourself can also help you stay prepared throughout the year by making the right choices and hanging on to the right documentation. Find Law offers information about various aspects of the law. The tax section provides a variety of articles about everything from basic audits to corporate taxes. You can browse the site by categories, check out the popular and most recent content, or search by keywords. All the content is written by legal and tax professionals, so you can trust the information for accuracy. The site also includes the option to post a question for these professionals to answer directly. Finally, the site offers legal forms and options to connect with an attorney near you. Silver Law PLC serves clients throughout Arizona, but you can use the site to find tax lawyers in other states. The legal resources from HG.org include a tax section. The site is not as extensive as Find Law – it’s more like an online resource guide than a directory of publications. However, the site does include several articles about taxation and tax law, and you can browse them right on the main page. Look for articles on U.S. tax law and international tax law. The site also includes a list of state tax agencies, as well as organizations that provide information about tax law and services for individuals and businesses. Of course, one of the best sources on tax law is THE source, the Internal Revenue Service. The IRS has a large website with information on everything from when to file to where to get the right forms. However, it has a specific section designed to answer tax law questions. The IRS makes it easy by giving you some broad categories, like frequently asked questions and tax topics. You can also search by keyword to find the answer to your specific question. A tax map and an interactive assistant are available to help if you are feeling overwhelmed or are stuck. Avvo helps you connect with lawyers and other experts to get the answers to your questions. You can either choose to talk to a lawyer on the site, or you can submit a form with your question. If you want to talk with someone, you’ll have to pay a fee. But submitting a question through the floor will be free. There are also options to fill out forms or to work with a lawyer on your issue. The site is organized by different legal topics. You won’t find tax as one of them, but you will find areas like employment, real estate, and estate planning, which will all include tax topics. Lawyer.com is primarily designed to help you connect with a lawyer near you. However, the site also includes some educational resources by legal topic, including taxation. You can search the site for lawyers according to your city, zip code, state or country. You can also browse by areas of practice. Each attorney profile shows you information about the person’s credentials, areas of expertise, years of experience and more. You’ll see an introduction written by the lawyer and will get options to contact the person. You’ll also see quick facts about whether the person charges a consultation fee, accepts pro bono cases, and more. Of course, none of these websites should ever take the place of the in-person advice you receive from an experienced tax law attorney in Paradise Valley. 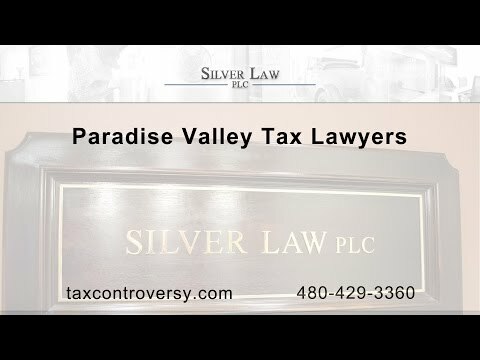 In Arizona, Silver Law PLC is available to help individuals and businesses with all kinds of tax questions and issues. We represent clients during audits, collections, and civil or criminal litigation. We provide assistance with innocent spouse relief, foreign tax reporting, and more. Our tax lawyers in Scottsdale are happy to provide guidance about tax issues or to represent clients in active tax matters. Call us in Arizona today to talk with a tax lawyer about your current tax issues or to schedule a sit-down to get the answers to your questions.